His dad, a middle-aged news reporter, was coming home from a business trip that he’d brought his son on. “You’re supposed to stay in your seat,” he said, pointing to the lit seatbelt light. There had been a bit of turbulance that started a few minutes back and the pilot had switched on the light to keep people from getting hurt if the plane jerked around. Justin looked around again. “I really need to go and there’s no flight attendants around to ask. I’m just going to go.” He unbuckled his seatbelt, stepped into the isle, and walked towards the nearest lavatory. The bathrooms were empty and Justin stepped inside one and closed the door behind him. A sudden burst of turbulance knocked him into the wall before he could catch himself. As standing was now out of the question with the increased rockiness of the ride, he sat down. From outside the door, he could hear the generic chatter of people talking amongst themselves, but nothing was loud enough to understand what they were saying. Justin didn’t really care; he just focused on doing his business. Suddenly, going to the bathroom didn’t sound like the smartest thing that Justin could have done right then. But really, he thought, he had no choice. It was either that or ask a flight attendant for an empty bottle. The flight was on its way back from Italy, where Justin and his dad had spent the past two weeks sightseeing and marveling at the beautiful architecture everywhere. When his dad had to leave for his business stuff, Justin would go out and explore the city. Although it had been an exciting two weeks for the both of them, a part of Justin wanted to stay home with the lady he’d grown to love, Emily. It had only been a month since he’d moved out and got a place with her, and he couldn’t have been happier. They’d started spending every free moment together, and it was a hard adjustment when Justin left for Italy, barely able to call every other night on a calling card. Now, on the flight home, Justin was counting down the seconds until he would see her beautiful face at the airport, waiting with open arms. He’d gone over in his mind whether he wanted to hug her, kiss her, sweep her off her feet and spin around, or some combination thereof, but he hadn’t yet decided. In the privacy of the bathroom, he smiled to himself as he thought about it. As he zipped up his fly and stood to return to his seat, Justin was violently flung at the wall again, this time hitting his head. It was a thin, artificial metal wall that could be categorized more as a “seperator” than a “wall,” so luckily he didn’t get that hurt. However, it was still a surprise to him, and he decided to sit down again for a moment to regain his composure. The atmosphere on the plane had changed; he could feel it even from within the isolated little box of a bathroom. The chatter had ceased and people were gripping their armrests with concern, waiting for more news from the pilot. Everything had changed. Something was wrong. 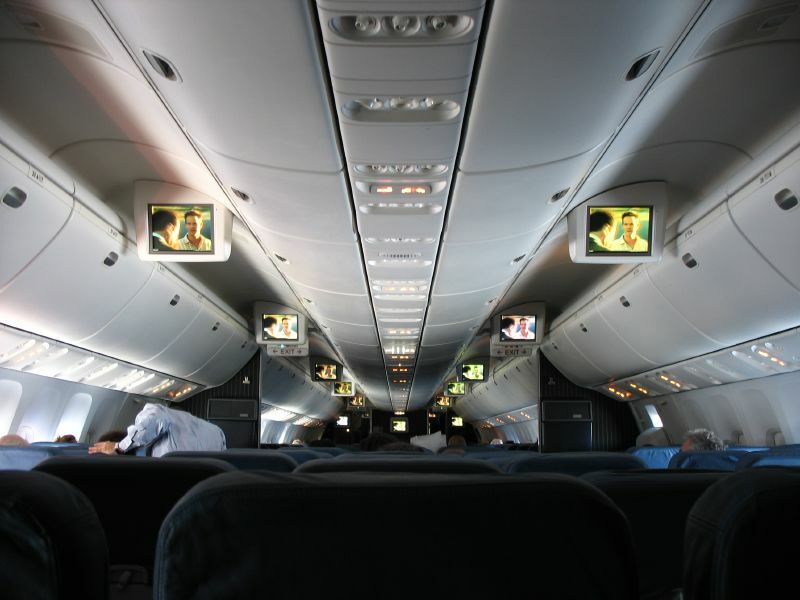 Someone in first class began shouting, and panic quickly swept through the plane. The mixture of yelling, confusion, and frequent turbulance prompted the pilot to make another statement. The two-tone beep that everyone had been waiting for returned again, and the plane was instantly silent. From the privacy of the lavatory, Justin merely whispered, “Oh god.” Other than that, he was speechless. Speechless, but not thoughtless. Emily rushed back into his mind, flooding everything else out. Her laugh, her smile, her eyes — it all begged him to just ignore the plane’s drama. To just be with her, if only in his mind. Widespread panic returned to the entirety of the plane. Air masks dropped, and a flight attendant demonstrated proper usage. Justin merely listened as she stood outside his lavatory to give one of the demonstrations. From inside his pocket, Justin retrieved his cell phone. Staring back at him with an everlasting smile was a picture of Emily he’d snapped on their first date. In the midst of chaos, he smiled. People screamed as the plane noticably lost control in the air and prepared to descend. Justin gripped his phone hard enough for his knuckles to lose color. Emily was all he could think about. He pressed her number on the speed dial and curled up on the floor of the lavatory with the phone to his ear. As the phone rang the first time, Justin’s heart got caught in his throat; and his gut got stuck where his heart was. The plane was freefalling from the sky, and those that hadn’t put their masks on continued screaming in horror. To Justin, the ring seemed to take an eternity, and he knew he didn’t have enough time. There was a slight pause between rings and Justin thought Emily had answered. She hadn’t, but even when Justin realized it, he continued talking as if she had. In his mind, the words, “Please answer” repeated over and over. As the second ring was almost finished, the click of Emily picking up the phone stopped Justin in his tracks. He didn’t take time to compose himself. He didn’t say hello or introduce himself. He merely was able to blurt out “I love you” before the plane came to an explosive end on the ground below.